While Liverpool's 3-0 win over Bournemouth on Saturday cut short talk of title run-in nerves on Merseyside this City victory, achieved with some glorious football against a top six opponent, was an emphatic statement. Rampant City have now scored 33 goals in their last five home games in all competitions and have a chance of lifting their first silverware of the season when they face Chelsea again at Wembley in the League Cup final on Feb. 24. City and Liverpool are both on 65 points with City having the better goal difference although they have played one more game than their rivals. Third-placed Tottenham Hotspur, who beat Leicester City 3-1 earlier on Sunday, are five points behind. Aguero, who scored a hat-trick seven days ago against Arsenal, has equalled Alan Shearer's record of 11 Premier League hat-tricks and is now joint top scorer in the league this season with Liverpool's Mohamed Salah. Chelsea had no time to settle before Raheem Sterling fired City ahead in the fourth minute with a side-foot finish after a quick free-kick from Kevin De Bruyne caught the visiting defence napping. After Aguero had somehow missed an open goal from two metres, the Argentine promptly beat goalkeeper Kepa Arrizabalaga with a blistering strike from 25 metres, underlining the fact that he is far more than a penalty area poacher. A poor header by Chelsea's Ross Barkley towards his own goal gifted Aguero with City's third, the Argentine firing home with a first-time shot on the turn, and then a low drive from Ilkay Gundogan made it 4-0 after 25 minutes. 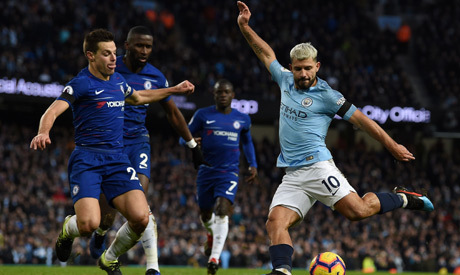 Following the break, Aguero, who also became City's all-time top scorer in league games, headed against the bar before he completed his hat-trick from the penalty spot after Sterling had been brought down by Cesar Azpilicueta. The defeat was Chelsea's worst since their 7-0 loss to Nottingham Forest in 1991 and will raise serious questions about the direction the team is going in under Italian Sarri as they slipped to sixth place on 50 points, a point off the top four.